It is quite obvious that you buy a thermostat to reduce your energy bills greatly. And, most of you might be interested to see how this device works, especially in these days of escalating energy prices. Well, the working of a thermostat is amazingly straight forward and constitutes some cool technology. 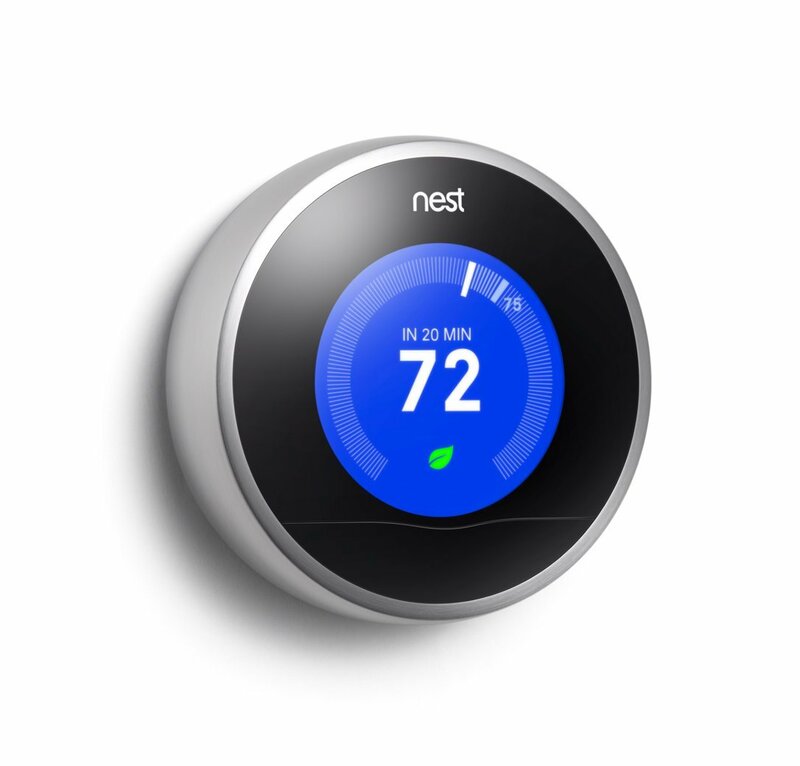 The traditional mechanical thermostats and the modern digital thermostats are the two main types of thermostats available. To know the working of a thermostat, it is a good idea to look at the parts of a non-digital thermostat that is still found in most of the older homes. Mercury Switch – The mercury switch is the integral part of a thermostat which is in the form of a glass vial with a little amount of real mercury in it. The glass vial has three wires – one wire extends to the bottom of the vial, being in contact with the mercury; another wire ends on the left side of the vial so that the mercury contacts it when the vial tilts to the left; the third wire has its ending on the right side of the vial so that the mercury can make contact between this wire and the first bottom wire when the vial tilts to the right. Thermometers – This kind of non-digital thermostat has two thermometers. One displays the temperature and is in the cover; the other controls the heating and cooling systems and is in the top layer of the thermostat. Coiled bimetallic strips are used as thermometers. Well, what are bimetallic strips? A bimetallic strip is a bit of metal that is made by laminating two varied types of metals together. When heated or cooled, these metals making up the strip expand and contract accordingly. When this coiled strip is heated, the metal inside expands more and the strip unwinds. A temperature-adjustment lever being connected to the center of the coil and the mercury switch being mounted at the end of the coil, when the coil winds or unwinds, it instructs or tips the mercury switch one way or the other. On the other hand, non-digital thermostats have two switches. Small metal balls are moved by these switches and these balls tend to make contact between different traces on the circuit card embedded within the thermostat. One switch controls the mode, that is, heating or cooling and the other switch has control over the circulation fan. Now, let’s see how these parts work collectively to make the thermostat work. When the lever on the thermostat is moved so as to turn up the heat, the lever rotates the thermometer coil and the mercury switch, eventually tipping them to the left. When the switch tips to the left, electric current flows through mercury in the mercury switch; this current energizes a relay that initiates the heater and the circulation fan in your house. The room gradually heats up and the thermometer coil, slowly and steadily, unwinds until it tips the mercury switch back to the right, thus breaking the circuit to turn off the heat. As the switch tips to the right, a relay initiates the air conditioner. The room cools and gradually the thermometer coil winds up until it tips the mercury switch back to the left. Fine, it is as simple as that, right? In fact, thermostats have another cool device, a heat anticipator. Before the air inside the thermostat reaches the set temperature, this device shuts off the heater. At times, parts of a house will reach the set temperature even before the part of the house where the thermostat is placed does. In such cases, the anticipator shuts off the heater a little earlier in order to give the heat time to reach the thermostat. In addition, there is a kind of resistor in the form of a loop of wire above the gadget. When the heater is running, the electric current that controls the heater travels from the mercury switch to the resistive loop through the yellow wire. Until it gets to the wiper, the current travels around the loop; from there, it travels via the hub of the anticipator ring and then down the circuit board that is present on the bottom layer of the thermostat. Similar to any other resistor, this also produces heat when electric current passes through it. The farther around the loop the wiper is positioned, the more amount of heat is produced by the resistor. This heat is sufficient to warm up the thermometer coil, making it to unwind and tip the mercury switch to the right side; consequently, the heater shuts off. Next, let us have a look at the electrical circuits in the device. The power the thermostat uses to switch on the different relays comes from the two transformers. The power to switch on the heating system, cooling system and the fan comes from the relays. Power from the air-conditioning transformer comes into the RC terminal. A mode switch controls a ball and this ball jumps the current onto a trace that leads to the terminal present in the lower right corner of the circuit board. A screw connects this terminal to the top layer of the thermostat. It connects to the pink wire that leads to the bottom wire of the mercury switch. If the air conditioning is on, the switch gets tilted to the right and the current travels into the blue wire through the mercury. A screw connects the blue wire to a lug in the lower left corner of the circuit card. From this position, the current moves to the other branch of the mode switch through a trace on the circuit card. 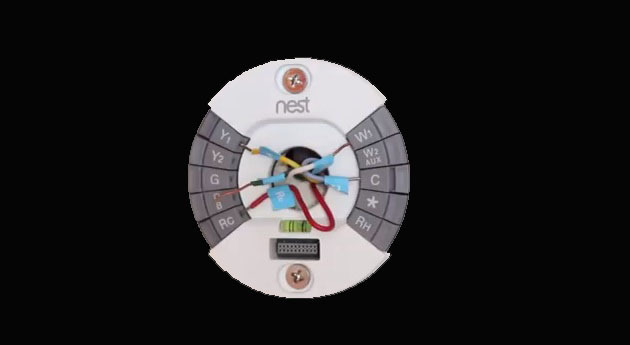 The ball in the mode switch jumps this current onto a trace which is connected to the terminal labeled G that energizes the fan and the terminal labeled Y that energizes the air conditioner. This is how current flows through the thermostat when the air conditioner is running. The same applies when the heater is running, just that power flows through the terminals labeled RH and W energizing the heater. 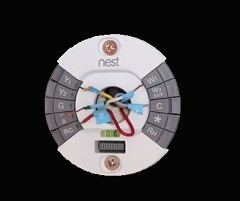 Well, these thermostats use a very simple device called a thermistor in order to measure temperature. This is a kind of resistor allowing electrical resistance changes with temperature. In a digital thermostat, the microcontroller measures the resistance and converts that number to a precise temperature reading. Needless to say, a digital thermostat can perform a few things that cannot be done by a regular mechanical thermostat. The most useful feature of this thermostat is the programmable settings; it is unquestionably a great money and energy saving feature as you can merely turn down the heat when there is no need for it. Now, what is system zoning? Have you ever noticed that some rooms in your house are always colder or warmer than the others? In fact, there are many explanations for this. One reason, as heat rises, the rooms on the second or third floors become too warm and the basement rooms are generally colder. Besides, rooms that have vaulted ceilings have a tough time retaining heat whereas rooms that get long hours of sunlight don’t cool down easily. These are merely a few reasons; however, regardless of why temperature in a room is uncomfortable, there is only one definite way to even out temperature in your house. And, that is by system zoning. System zoning is a simple process. It involves a number of thermostats being wired to a control panel that operates the dampers provided within the duct work of your forced-air system. According to the settings of the thermostat, these thermostats continually read the temperature to their particular zone, then open or close the dampers present within the duct work. System zoning is helpful for houses that have inconsistent room temperatures as well as for heating or cooling individual bedrooms depending on the favorite temperature setting. In case you have a guest room that is normally not used by anyone, you can just shut the room’s door and close the damper. It is as simple as that. Obviously, system zoning can help save a lot of money on your energy bills. It is believed that you can save up to 30% on a typical heating and cooling bill! As seldom-used rooms like guest rooms don’t require constant heating or cooling, the process of system zoning helps you save money by running temperature-controlled air to these rooms only when need arises.